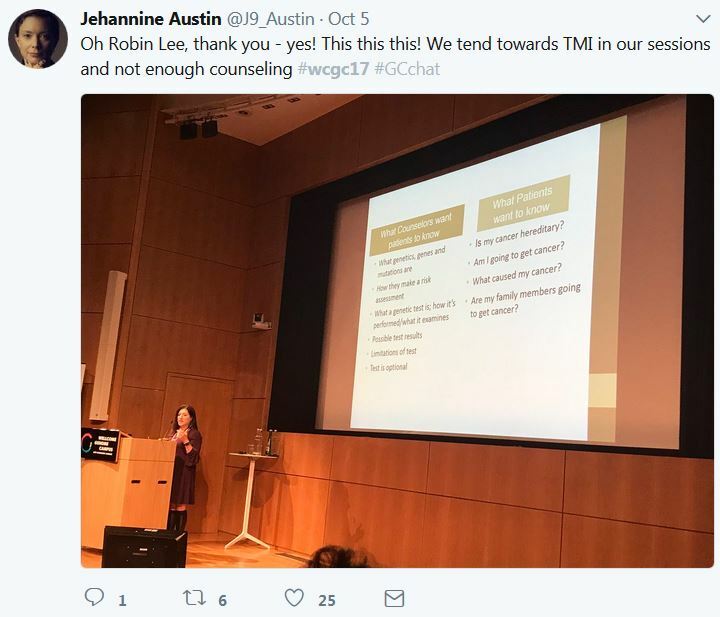 International research leaders from the genetic counselling community gathered at the Wellcome Genome Campus for the first World Congress on Genetic Counselling on 4-6 October 2017. 220 delegates from 24 different countries were brought together by their shared interest in the psychological and emotional impact of genomics, and a desire to better understand the techniques available to communicate genomic information to publics, patients and wider society. The programme followed the patient journey, starting with how wider publics interact with genomics as consumers and citizens. The expansion of direct-to-consumer genetic testing companies was discussed, as well as the wealth of online platforms and apps where genomic data can be analysed and interpreted. Genetic counselling clinicians then shared research showing that what genetic counsellors perceive as important does not fit with what patients want. Whilst counsellors see the value in explaining what a gene is and what risk is, patients are more interested in knowing whether they will get a certain condition or not, rather than the basic science. After an onstage debate between two senior genetic counsellors from the UK and Canada discussing relevant psychotherapeutic models of counselling within today’s genomic healthcare, there was extensive audience participation about mainstreaming communication techniques to the wider healthcare profession. Delegates explored whether, and how, the process of genetic counselling can be automated and provided via chatbots (there are already examples of this happening), and how this fits within the classical models of practice. Experience from genetic counsellors who are leading national sequencing projects indicates that genetic counselling should be able to encompass alternative models of service delivery, and an extensive discussion was had about differentiating between education about genomics and counselling about genomics. Conclusion? Whilst the former can be done by any health profession (or even a chatbot), the latter should remain the expertise of genetic counsellors. Conference participants also heard about sequencing projects taking place around the world, such as the BabySeq project and sequencing of healthy publics, and about the experiences of the genetic counsellors involved with these. Another area of discussion was a focus on the families of those affected by a genetic condition, and the long-term effect of this on family functioning: distress about a genetic condition can be very far-reaching, and delegates learnt how family systems theory offers techniques on how to help families needing longer-term support. This was an incredible event, bringing together world leaders in Genetic Counselling all with a common goal of helping patients and publics make sense of genomic information. The conference was a true Connecting Science success: it was funded and organised by Advanced Courses and Scientific Conferences; Society and Ethics Research provided expertise, proposing the Scientific Programme Committee and presenting their research at the conference; and the Conference Centre provided the relaxed environment for the Congress to thrive. The Scientific Programme Committee were international experts Anna Middleton (Wellcome Genome Campus Society and Ethics Research), Christine Patch (2017 President of the European Society of Human Genetics) and Barbara Biesecker (National Human Genome Research Institute, USA). The programme was designed by genetic counsellors for genetic counsellors. With members of the audience representing most of the leading professional bodies for genetic counsellors across the world, the Scientific Programme Committee were pleased and satisfied that the Congress met an unmet need in showcasing the latest empirical research relevant to genetic counselling practice. See how the #WCGC17 unravelled on Twitter.